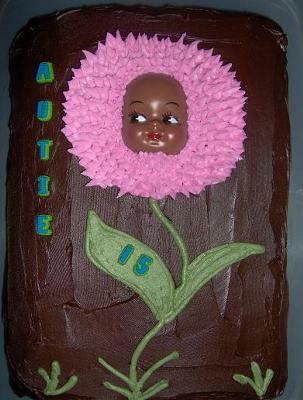 This flower cake is also for my daughter. I used 1 cake mix and baked in a 9" x 13" pan. I used canned chocolate icing and covered cake. That is what she asked for. But, I added the little face with flower petals around it and added a stem and leaves out of buttercream in pink and green. I bought the face at a hobby store. A lady in my fabric shop gave me the idea. I also used the pre-made candy letters. Very cute idea! This was a great idea to dress up a cake! It turned out wonderful. I am sure your daughter loved it! Join in and write your own page! It's easy to do. How? Simply click here to return to Flower Cake.